The real Guitar Gable (Gabriel Perrodin) will get with his old pal King Karl (Bernard Jolivette) and drummer Jockey Etienne for a straight up swamp boogie revue- expect the classic "Congo Mombo" and whole lot more. In the annals of bayou guitar slingers, few men can claim a pedigree as distinguished as that of Guitar Gable. Born Gabriel Perrodin, Gable's echo-drenched six-string licks define the exotic Crowley studio sound that producer J.D. Miller perfected during the '50s. Picking his Telecaster with an advanced-yet edgy feel, and with the help of the amazing Clarence "Jockey" Etienne on drums, Gable came up with a string of Caribbean-laced instrumentals like "Congo Mombo," "Guitar Rhumbo" and—perhaps the rarest and greatest of all of them—"Gumbo Mambo," that are as much a part of South Louisiana's rock 'n' roll atmosphere as the songs of Fats Domino and Bobby Charles. 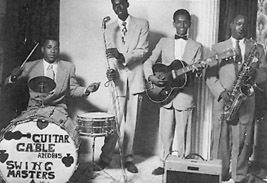 Born into a family of mixed ancestry (Gable's father was a true Creole in the South Louisiana sense of the word, with black, white and native American blood) in 1937, Gable had perfected his guitar style by the age of sixteen, when he formed a band called the Swing Masters. Two years later he was introduced to King Karl. "Guitar Gable had been playing jobs with some little guy out of Lafayette," Karl recalled to swamp pop historian Shane Bernard. "Anyhow, there was this priest, Father Millet, and one day he said, 'I was told you was fixing to be in a band. I got a good boy. I would like for you to get together with him 'cause I don't like the company he's with." Father Millet should have awarded Karl with a badge of honor for quick action. Showing up at the Swing Masters' gig that very night, Karl sang a few songs and the crowd went wild. Afterwards, Gable quit the Swing Masters and with Etienne in tow, formed a new outfit with Karl called the Musical Kings. Millet was no doubt overjoyed, but he couldn't have been as excited as the Kings' legions of teenage fans who placed them alongside Cookie and the Cupcakes as among the greatest bands they'd ever seen. The pair soon revolutionized the swamp pop lexicon with bluesy, heart-wrenching ballads such as "Irene," "Life Problem" and "This Should Go On Forever"—ridden to the top of the charts in 1958 by Rod Bernard—as well as rockers like "Cool, Calm, Collected" and "Walking Through the Park." While their material is most closely associated with Excello Records, Gable and Karl had some excellent releases during the '60s on the La Louisianne label and its subsidiary, Tamm. The Kings broke up in 1968, but reformed in 1995. With Jockey Etienne still behind the drum kit, their inherently raw, visceral approach is as close to what this music sounded like when it was invented as anyone will ever hear live in the new millennium.